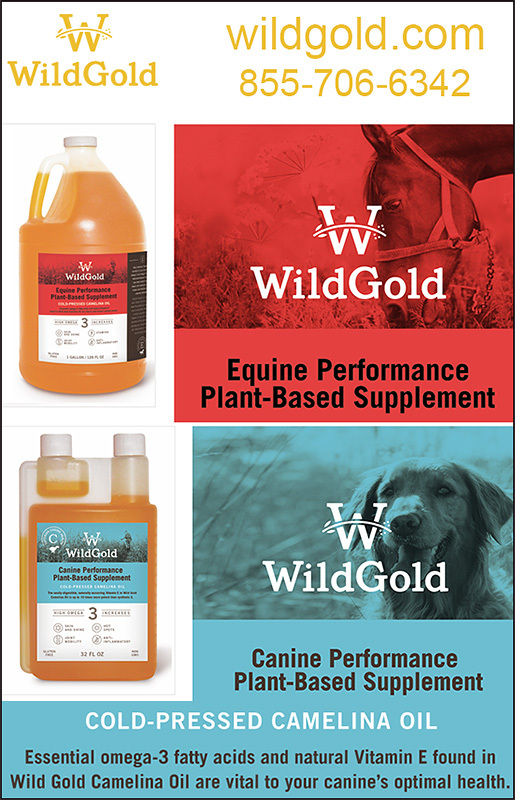 Wild Gold offers the HIGHEST quality Omega Supplements for horses, dogs and humans! Now they have an amazing Pre & Probiotic Vitiman Mineral Formulation too! Besides being essential to your horse or dog's diet, the omega-3 and omega-6 fatty acids in Wild Gold Original Camelina Oil have been shown to positively impact cell membrane response to trauma and infection as well as reducing inflammation. Recent research in horses has even shown that fatty acids may have the potential to help regulate insulin sensitivity. Wild Gold also contains naturally occurring Vitamin E that not only prevents rancidity of the product but also provides your horse with a potent anti-inflammatory in a form that can be easily digested. Premium Wild Gold For Horses…. Many performance horses are at risk of gastrointestinal distress caused by frequent changes in their hay, the stress of travel, and the rigors of training or even daily life. Performance demands may also increase inflammation and take their toll on immune function. Wild Gold Premium has been formulated to provide your horse with added support from DHA, a more potent anti-inflammatory omega-3 fatty acid, as well as Alltech’s Bio-Mos® to promote good digestive bacteria, and Aloe Vera Shown to positively impact ulcers. How Can Wild Gold Plant Based Supplement Help My Dogs? The omega fatty acids in Wild Gold Camelina Oil benefit your dog in many ways. Their powerful anti-inflammatory properties not only reduce inflammation, but improve joint, heart, brain health and blood circulation. They work to reduce shedding, give dogs glossier coats and healthier skin, and help prevent and treat hot spots. Omega fatty acids also provide much needed energy for performance dogs. What About Wild Gold Supplement for People? You may already know the importance of polyunsaturated (omega-3s and 6s) and monounsaturated fats (omega-9s) to a healthy diet, but you may not know that the balance of these fats is just as significant to your good health. If not balanced by omega-3, too much of certain types of omega-6s in the diet can result in inflammation, which is associated with a number of health concerns, including asthma and allergies, heart disease, arthritis, and diabetes. Wild Gold Camelina Oil has an ideal balance with a 2:1:2 ratio of omega-3, -6, and -9, respectively. Why Should I Use Camelina Oil? Why Camelina? Besides being essential to your horse’s diet, the Omega-3 and Omega-6 fatty acids in Wild Gold Original Camelina Oil have been shown to positively impact cell membrane response to trauma and infection. Recent research in horses has even shown that fatty acids may have the potential to help regulate insulin sensitivity. Wild Gold also contains naturally occurring Vitamin E that not only prevents rancidity of the product but also provides your horse with a potent anti-inflammatory in a form that can be easily digested. Is It True That Wild Gold Has A Pre & Probiotic Vitamin Mineral Formulation For Horses? Yes! With the pre and probiotics, our Mineral & Vitamin Formulation conditions both the gut intestinal tract with live viable naturally occurring microorganisms which are necessary for proper digestion. With the salt and trace minerals provided, the animal requires water which promotes hydration. The zeolite clay has one of the best molecular structures to remove toxins from the body gut and intestinal tract. The selenium and biotin are always brought to our attention, for the health of the horses we have both in our formulation. The purpose of our formulation, is to combine the Mineral & Vitamin Pre and Probiotic Formulation with our Wild Gold Original or Premium Camelina plant-based oil supplement. This combination along with good hay is all you need for good well-rounded nutrition for your horse. * Best vitamin and mineral to the market at a reasonable price so the horses get the nutrition necessary for proper health due to the lack of grazing for a good potion of the competition horses. * Complex vitamin and mineral with the pre and pro biotics for gut health and a detox as well. * Electrolytes are included in this formula and we have had reports that non-sweating horses actually started to sweat again! What Do Customers Say About Wild Gold Products? Love this supplement!!! My horse’s coat is getting shinier every day!! And my horse had Bog Spovin in both hocks and the right one is completely gone and the left one is half the size it was before using Wild Gold. I can’t wait to put the rest of my horses on this supplement. I give the same supplement to my dogs: 5 Border Collies, the coats look so shiny and clean, the brown dingy color that the white gets in their coat is almost completely gone!! I would recommend Wild Gold to everyone!! Thank you Wild Gold! I have campaigned this mare for more than 5 years and she just ran her best race, a stake win at the ripe age of 11! Thank you for introducing me to your products, she looks and feels great! Honestly, I just didn’t know if this product could help my best buddy, DREAM a beautiful, 1400 pound 17 year old QuarterHorse/ Percheron Gelding . Dream has been battling sore hocks for years. After trying every joint supplement we could find, we settled on one that he seemed to do pretty well with, but we just couldn’t get him to fully sound. We kept him on the joint supplement that he had been on for years, added Wild Gold and the results have been ASTOUNDING. He is moving better, more freely than EVER before… I feel like he is 10 years old again— and am back to riding— I couldn’t be happier! Why Not Help Your Horses and Dogs To Enjoy The Benefit That Wild Gold Has To Offer Today? Try it one month— just one month— and see if you don’t see the difference in your dog or horse, that thousands of clients have seen and are raving about. Wild Gold can make a huge difference in the health and well being of your horses and dogs. Call us today— we’re excited to talk to you and get you started.